Airshows are a great place to study airplanes and crowd psychology. We wait patiently in long lines for hotdogs, bathrooms and overpriced water. 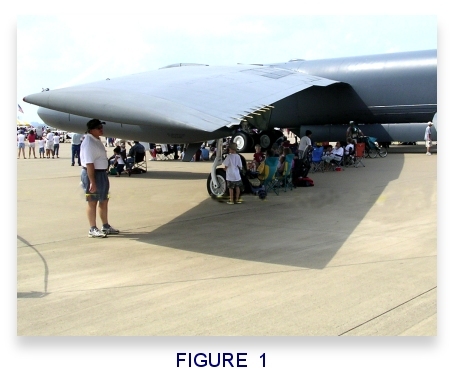 Of course, people do that at all large gatherings, but the one group activity found only at airshows is the creation of the people-filled shadows, as shown in Figure 1. As the hot Sun cooks the crowd, they migrate under the protective wing shadows of huge airplanes, preferably a C-130 or a B-52 bomber; something with a huge wing area. And just like that, we’ve discovered yet another practical use for airplane wings! This primer talks about why we have wings at all. As the aerodynamicist Jack Moran said, wings are simply a thrust amplifier. Sure, we could use rockets to get from point A to point B, but that would be incredibly inefficient as far as fuel usage goes. That’s where wings come in. They provide a similar ability to defy gravity, but at a fraction of the fuel usage compared to rockets. Rather than use directed raw force, wings have a unique characteristic; they generate a force that is perpendicular to the direction of movement. Airplanes move horizontally and wings push up vertically (LIFT). This magic of physics is simply a result of how air flows over the wings. This tutorial is about how lift is created, how to estimate it, and how to make it happen. The origin of lift is very simple: it is the result of having lower air pressure above the wing than below it. Air cannot impart direct forces on a wing like a hammer can. Instead, it can only impart forces via two methods: pressure and friction. Those are the only two methods. I will repeat: lift is the result of having lower pressure above the wing than the pressure below it. Pretty simple eh?